According to the certifications received, Sun Park Co. and its food processing and packaging partners have satisfied the requirements of the European Regulation (E.C.) 834/2007 (Article 29, paragraph 1) and European Regulation (EC) 889/2008 (Article 68). 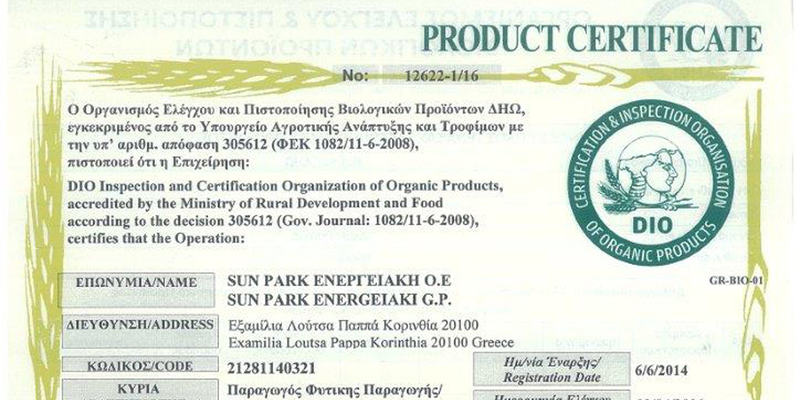 Our certifications is a testament of our commitment into following a documented organic farming and quality assurance policy and provide evidence that all of our functions are implemented according to certified processes by trained personnel. At the same time, we take into account in all our dealings the need for environmental protection. We continuously seek out new ways to minimize the effects of our operations to the environment such as energy and paper conservation and recycling.